In my previous post, I mentioned that Decker’s introductory grammar to Koine Greek is large, outweighing even Wallace’s Beyond the Basics. Now that I’ve read the introduction and the first two chapters, I thought I should provide a follow up post explaining, in Decker’s own terms, why this volume is as large as it is. 1) Decker includes a number of other features within the Grammar absent in others. For instance, he provides the student and teacher with two different systems of pronunciation instead of just giving the Erasmian schema (13). 2) He also alerts the reader to the presence of linguistically informed discussions throughout the book (xxiii). 3) The grammar is a hybrid between inductive and deductive approaches to teaching a language. That is to say, while the grammar is organized according to a deductive framework, he uses an “inductive reading-based approach” throughout the volume (xxiii). 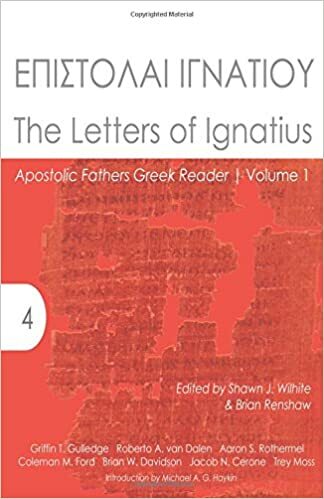 This greatly increases the size of the volume as it, in essence, weds an introductory grammar to a Koine Greek Reader. The reason for this is simple: I have found that students repeatedly and habitually turn to their first-year grammar in later years when they need help with a perplexity in a text. Though the answer might in many cases be found in the more advanced grammars, having some introduction in the first book for which they reach has its advantages, especially if the question concerns not just a syntactical issue but is related to the forms of the language (often not included in intermediate or advanced texts). (xxiv). 5) Decker strives to provide a grammar that is accessible to students without the aid of an instructor. Many grammars have the bare essentials needed for learning the language, but without the aid of a professor, students will have difficulties learning the language. Accordingly, Decker includes detailed discussions and several examples to help bridge the gap between what one knows about English and what is expected in order to learn Greek. Much like I said in my previous post . . . wow! As I have started reading through the chapters, I’ve found the discussions quite helpful and up-to-date. The prose is easy to read and is insightful. Decker’s decision to use an inductive approach within a deductive framework is needed. I’ve always wanted to see a grammar that incorporates more natural Greek earlier on and one that provides extended sections for translation at the end of chapters. Short sentences do not simulate the reading experience. Also, Decker’s inclusion of more details within the grammar on account of the fact that students always return to their initial grammar is well-reasoned. Dr. Black’s Grammar has long been my first stop shop for paradigms or grammatical and syntactical discussions for me. Student’s of Decker’s grammar will be well served by the addition of this detail. Despite all these strengths—and there are many more that I will probably highlight in future posts—the magnitude of the volume is overwhelming, even for experienced students of Koine Greek. The prose is dense. Chapter 1, for example, on the alphabet (letters, pronunciation, vowels, diphthongs, diaeresis, breathing marks, punctuation, and accents) is 17 pages long, twice as long as another Greek Grammar. Though the material is arranged in a manner that makes it easy to skip unnecessary and more detailed sections, knowing this does not help to ease the mind. Chapter 2, on the nominative and accusative cases, has individual discussions on how case, gender, and number work in English and Greek. While helpful, it seems redundant as both discussions could have been treated together with greater economy. I acknowledge that Decker handily deals with this criticism in the introduction of the volume. He notes that much of what he will include would typically be a part of the teacher’s art within the classroom experience. He has included it, nevertheless, as a means of assisting students without teachers and for those that will regularly return to the volume for answers. Still, I believe it may have been more beneficial to have two versions of the text: a teacher’s edition (which I believe this volume is) and a student’s edition. That is to say, when I teach a Greek Grammar class, I typically include all the information Decker includes in his discussions within the classroom and I often look for examples in order to illustrate the material and make comparisons with English. Towards that end, I will, in the future, routinely come to Decker’s grammar for his explanations and examples. Students may get frustrated or distracted, however, by the extensive reading before arriving at the heart of the material. Croy’s grammar mitigates this, for example, by providing students and teachers with a supplemental .pdf file that contains lengthier explanations, worksheets, and handouts. This criticism should not be a determining factor in using this book inside of outside the classroom. In my experience, many students benefit from a variety of ways of explaining certain features. By including his detailed approach, students will benefit (1) from a different manner of teaching than their own professor, and (2) possess a comprehensive set of notes to which they can always return. This entry was posted in Greek, Greek Resources, NT Greek and tagged Decker, Greek Grammar, Review. Bookmark the permalink. I’ve heard the same criticism about Groton’s commonly used classical Greek book, “From Alpha to Omega.” Still, I might get Decker for my own review. The size of the work and the amount of information that is contained within surely cannot be worse than Porter’s first year grammar, can it? The content of Decker’s work is excellent. Nothing bad about it at all, just overwhelming in terms of size. I wish I could make a comparison with Porter, but his methodology never appealed to me, so I haven’t purchased it. One of these days I will get around to checking it out of a library. Still, would you use it as the main text in a first year class? or would you just stick with Black? I havent made it far enough through to make that judgment. Also, I’m rather biased towards Black’s grammar, so I’m not sure I can be the best judge. It took me a while to switch from Croy (the grammar from which I learned Greek) to Black. It is difficult to dislodge the granmars wr are familiar with, regardless of the value of a new one. As I make my way througj Decker, though, i may be in a better position to field that question. i can understand being biased to your mentor’s grammar! I have much preference for it too. seems like Decker would be a great supplemental resource. I used this text (in its initial .pdf form) several years ago as one of Dr Decker’s online Greek seminary students at BBS. I found it very informative, helpful, and non-threatening. Having said that, I too just received the book from Amazon and was surprised by its girth. I asked myself, “Did I really learn all of that in two semesters?” Wow. Scanning the pages, I can tell additional content has been added since the last .pdf version I received in my exegesis classes. That being said, I regularly refer to my .pdf copy when I’m working through certain exegetical issues, particularly verbal aspect. I like my .pdf copy because I can search it pretty quickly for a concept, paradigm, or verse. One thing I think is missing in the print edition is a list of Scriptures he either uses or discusses in the book. For example, when he discusses tense-form and verbal aspect he references several passages that helpfully illustrate how verbal aspect should be used in exegesis.